When I dove into the kid lit community a couple of years ago, one of first my role models, especially since I loved to write in rhyme, was Corey Rosen Schwartz. And she still is! Recently, I found out Corey and her co-author, Becky Gomez, have a new book that just came out in June. So when Becky agreed to participate in Will Write for Cookies, I did a happy dance. 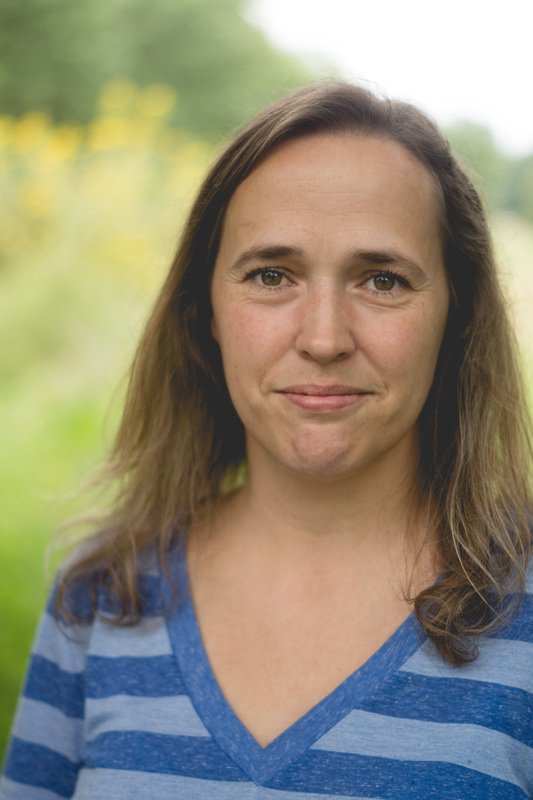 Rebecca J. Gomez is the coauthor of WHAT ABOUT MOOSE? , a picture book published by Atheneum Books for Young Readers. She lives in Nebraska with her hubby, three kids, two poodles, and one parrotlet. Parrotlet? I had to look that one up. It is a mini-parrot with a lot of personality. Sounds like a picture book mc to me. I’m excited to welcome Becky. She’s got a lot to share with us so let’s get started. Oh gosh. This is hard to answer. We had a lot of Little Golden Books when I was a kid, probably because they were so affordable. I adored The Poky Little Puppy and The Monster at the End of this Book. But the name that jumped out at me when I saw this question was Shel Silverstein. His poems and drawings have been a part of my life since before I can remember. I’m sure he had something to do with my desire to write my own rhymes when as young as five! Dr. Seuss was a big one too, of course. You know, I almost answered this question, “How long and hard this journey was going to be!” But then I realized that not knowing how long and hard something is going to be is part of the adventure. I tell my kids often that if something is worth accomplishing, then it is worth the struggle it takes to get it done. And that is definitely true of this process, at least for me. Looking back, I don’t know if there is anything I would change to make it easier. But, something that I didn’t know right away, and that probably would have been a big encouragement to me when I first set out, is that so many of my favorite authors were rejected dozens of times before selling their first book. Rejections are just bumps in the road, but when you have enough of them together, they can make for pretty rough travel! That is part of every author’s journey though. And that thought is very encouraging! All of the above! Well, actually, I don’t own a laptop. But I do have a tablet and I use it in a pinch, like when I want to access a document on Google drive when I’m sitting in bed. I do love to draft by hand, though. With a mechanical pencil. In a composition notebook. Writing by hand in the early stages of a manuscript seems to help the words flow better for me than when I’m staring at a glowing screen. Plus, when I get stuck, I doodle in the margins. It’s very freeing! I can take a pencil and notebook anywhere–out on the deck, in the car on a road trip, to church (just in case! )–and it never has to be charged up. That said, I do have an official space in the corner of my family room where most of the “work” is done. I’d like to have a real office in the attic of an old house someday. I can dream, right? Of course there are exceptions. The muse is notorious for not sticking to a schedule. But that is what my handy dandy notebook is for! Because I have to. Honestly. I’ve been a writer all my life. When I was a kid I wrote about childish things, and that hasn’t changed. Though I’ve written a few little things for adults, my writer brain doesn’t seem to want to grow up. As a reader, I prefer reading stories that are written for kids–picture books, middle grade novels, young adult novels, even poetry collections–so I guess it makes sense that those are the things I want to write. I love words, and ever since I was very young I’ve loved stringing those words together to create poems and stories. And stories that are written for children just seem to be the purest and truest stories (and poems!) in the world. Plus, I love kids. I love the way they react to stories. The giggles and gasps, the oohs and ahs, the exclamations of “read it again!” That is pure magic. ME: Becky, do you have any other tips or thoughts you’d like to share with everyone? An important thing to remember as a writer is that it is okay to write crap. When I get a new story or poem idea, the most important thing for me is to get the story down on paper. I do my best work and have the most fun (usually) during the revision process. Even when I’m writing with my coauthor, Corey Rosen Schwartz, we try to get the bones of a story down before really giving it any meat or worrying about word choice and meter. It’s better to have something a little wonky to polish up than to try to make a story perfect from line one. For writers of rhyme, my advice is to read lots and lots of rhyming picture books by lots of different authors. Read them aloud, to yourself and to kids. Note what works and what doesn’t. Read your own rhyming manuscripts aloud to yourself and to kids and to other adults, and ask some other adults to do the same. One of the things that helps Corey and me write fabulous rhyme together is that we live in different parts of the country, so we talk differently. Rhyme doesn’t always work the same for me as it does for her. So we are forced to make it work for both of us, which helps ensure that it will work for a wider range of readers. The truth is, there will almost always be some reader who stumbles on some part of a rhyming story no matter how perfect it is. But if you are willing to do the hard work, that will be less of an issue for you. That is so important, Becky! I’m glad you mentioned that because, without the aspect of fun, we might as well do something else. I know all of you want to join me in thanking Becky for sharing all of this writer-love! If you’d like to connect with Becky or find out more about her book and her writing: www.rebeccajgomez.com. And there’s MORE! 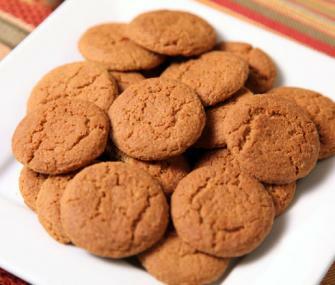 Becky is also sharing a yummy Gingersnap Cookie recipe. Here’s a recipe I like to bake when I want something different than the usual homemade chocolate chip. These spicy-sweet treats are quick and easy. In a mixing bowl combine about half of the flour, the brown sugar, shortening, molasses, egg, baking soda and spices. Beat with an electric mixer on medium speed till thoroughly combined. Beat in remaining flour. Shape dough into 1-inch balls. Roll in sugar. Place two inches apart on an ungreased cookie sheet. Bake in a 375 degree oven for 8-10 minutes or until set and tops are crackled. Cool on a wire rack. Makes about 4 dozen. A million thanks, Becky! I’m a gingersnap fan—I will definitely try these. I hope you all have a great weekend. Summer is winding down and school is starting in many places. Please be safe if you are traveling, have fun whether you are at home or away, and read lots of books! 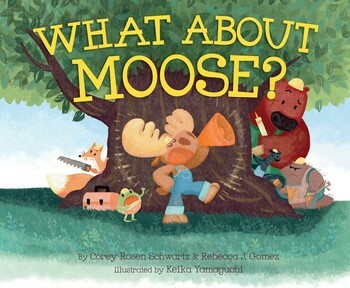 This entry was posted in Author/illustrator interviews, Rebecca Gomez, Will Write for Cookies and tagged Becky Gomez, Corey Rosen Schwartz, What About Moose?, Writing tips by viviankirkfield. Bookmark the permalink. Great interview! Thanks for sharing with us, Rebecca. My pleasure! It was fun! Lots of good information and inspiration! Thank you Becky! Glad you got a lot of value from the interview, Mary Jo – I appreciate your thoughtful comment. 😉 And I’m looking forward to seeing you again in October at our book event at Toadstool Bookstore!!!! I bet Moose would inhale a couple dozen of those gingersnaps . . . I know I would! Best of luck with the book. It looks and sounds charming. He definitely would, and I’m pretty sure he would share with his friends too! I’ve been meaning to check out Corey and Rebecca’s book, so thanks for the reminder! And Becky, thanks for sharing some words of wisdom with us. I enjoyed reading your thoughts. I’m happy we tweaked your memory, Sandy…there is always so much going on…but I know you will love this picture book – it’s a winner! Glad to hear it, Sandy! I hope you enjoy reading the book too. Sounds like a charming and fun book! Great interview. I enjoyed meeting Becky and learning more about her and her collaborative work. I give a lot of credit to authors who can work together…sometimes it’s hard enough just listening to myself when I’m trying to do writing or revisions. 😉 Glad you enjoyed the interview and book, Pat! Thanks again for having me, Vivian. It’s such a fun feature! Can’t go wrong with books and cookies! Ditto, Becky…books and cookies make a great combination – and What About Moose and gingersnaps are winners!